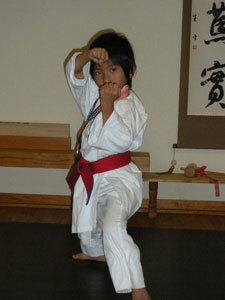 "Children in Our Dojo Develop Character!" For more than half a century, we have successfully taught children to overcome their setbacks and obstacles, and in so doing our children come to know how it feels to savor success when they persevere. This is a way to develop true self-confidence and strong character. As a result of their training, our students always show significant improvement in their personal achievements. Making improvement means to fix where there is an error. Our goal for your children at the Chintokan dojo is to help them to be courageous and courteous, honest and dependable, and strong in mind, spirit and body. In our dojo, children are taught to compete fairly with others, to value and strive for victory, to learn from defeat, and to show good sportsmanship regardless of the outcome. They learn the importance of showing respect and exhibiting proper etiquette, both to other people, and to the dojo itself and all that it represents. Children at Chintokan learn the value of physical training and exercise, and experience first-hand the benefits of self-discipline, effort, and perseverance. They learn to be proud of what they have achieved, as represented by ranks and awards, because they know that they have earned them through their own efforts. They learn to be leaders, to lead others by example, and also to learn from the examples others provide. "We take pride in the hard work we put into the training!" "Apply 150% EVERY TIME, and NOT just sometimes!" "Don't give up or think of a way to slack, cheat or quit!" "Know that when you cheat, you are only cheating yourself!" "Lead others by setting the best example"
Children studying at Chintokan dojo practice, in addition to our core Okinawa Shorin Ryu style, Japanese Kyogi (Sport) karate from All Japan Karate Do Federation. This organization represents primarily Shito Ryu, Goju Ryu, Shotokan and Wado Ryu Karate. Chintokan Karate Do is also rich in this area, as Soke M. Sakimukai was for many years highly regarded “WUKO” International Kata and Kumite competition judge, and was qualified to teach the elite competition mandatory kata chosen from those styles. WUKO is presently known as World Karate Do Federation, WKF. WKF is the exclusive governing body for the Olympics, and its Kata and Kumite Regulations will be applied to the next Olympics Karate in Tokyo, Japan. DON'T BECOME THE VICTIM! We emphasize the development of self-confidence, self-reliance, and strong character in children. We firmly believe that these are powerful tools that can help children defend themselves against bullying in their interactions with other children. Also, we teach them not to become bullies themselves in interactions where they are helping another who is being bullied. Learning to physically and mentally defend or control oneself in a martial arts school is a start, but only just the beginning. Engaging in a carefully constructed traditional and modern program of mental and physical exercise routines, with regularity and persistence, over time helps to develop unmatched inner strength in children. 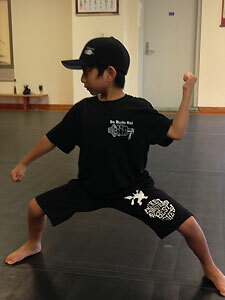 In our opinion, training with other children at the dojo under the supervision of our instructors, and perhaps even competing in tournaments on the local or even national levels, contribute to enhancing the appropriate knowledge, self control, strategic planning and martial arts skills necessary to win out against aggression, treachery and abusive behaviors by others. Martial arts training, in the form of basic drills, kata, prearranged self-defense sequences and free sparring, is the vehicle we use to help you to instill these character traits in your children. Having fun learning should naturally be a part of this training. Ensuring that students (especially children) enjoy practicing makes it much easier to engage them, retain their attention, and inspire them to greater efforts. But just as the ultimate goal of traditional martial arts training is not just learning physical skills, but also improving the whole person, Chintokan too emphasizes the development of character. In this way we differ from the majority of other karate schools, and we are quite proud of that difference. These fundamentals of martial arts have always been our focus, and though they do not develop overnight, we believe that they aid significantly in preventing a child from ever becoming a victim of any kind. In keeping with this, we aim to reduce discriminatory isolation by fostering courageous children. Similarly, we firmly believe that the state of mind and body required to maintain a sharp focus, plan ahead quickly, exhibit fast reflexes, and engage in strenuous movements for extended periods of time is impossible to attain under the influence of controlled substances. We encourage constant progression by providing students with tasks that are progressively harder to fulfill, so as to develop the inner strength and mental preparedness necessary to overcome the many obstacles that will be placed in their paths throughout their lives. The spirit of effort and self-determination that this path fosters in children helps to make them confident and reliant on themselves, and therefore less susceptible to peer pressure. 4-5 years old – Enroll with Parent(s) Only – We offer this unique, once-a-week experience for parent(s) who wish to give their children the opportunity to start at a younger age, and where you can join and experience the Chintokan martial arts class with your child: Saturdays at 10:00 am. We do provide a traditional Okinawan/Japanese "weapons training" as part of our children's curriculum for students who have achieved the intermediate-level color belt. This minimum level of study is required because, in general, the weapon movements are deceptively intricate and therefore more difficult to learn and remember than techniques involving just the hands and feet. Our traditional methods of weapon training develop superior focus, coordination, endurance and agility, and can help increase the ability to learn, by developing the flexibility of the mind, as well as that of the body. However, this takes time and perseverance. Anything of great value does not come easy. As safety is a primary concern, the first weapon techniques introduced involve the long staff (Bo) techniques using a shorter staff, with progression to longer staff next. Later, after students have become proficient with both long and short staffs, they are permitted to move on to other weapons, if they choose. In the dojo, we take pride in the hard work we put into training, regardless of the outcome. One of Soke's recurring instructions to his students was to "always do your best, don't give up, and finish what you start!" and we attempt to carry on that tradition every day.